How Can I Verify the Validity of an IPA Letter? I received the following in a PM, and will answer here. Hi, a friend of mine (Indian) received an IPA no. from an agent and has been asked to pay the fees. My friend is unable to trust the agent because of some issues he encountered with him, is there any way he can verify if the IPA is real. He has the IPA no. Please let me know. Thanks for your help. If your friend has received his IPA number, then it is his FIN number, ie, the ID number that will be assigned permanently to him and printed on his employment or work pass when he picks it up. See the example below. Your friend should ask for a copy of the letter to be scanned or faxed to him to verify that it looks like the example below. There will also be as many as 8 additional pages covering medical items, required documentation, etc. The agent should also supply this to your friend. You can also go to this website to see if it is a valid FIN number: http://nric.biz/. Note that this does not actually verify if a number has been issued, only that it is a valid number with a correct checksum. Other than that, your friend should email/call MOM and ask that his IPA be verified. Once again, I am posting a PM response. Poster, please make your posts here. Hi, thank you so much for your response, I checked in the link that you gave me, but it says the number of digits is wrong. 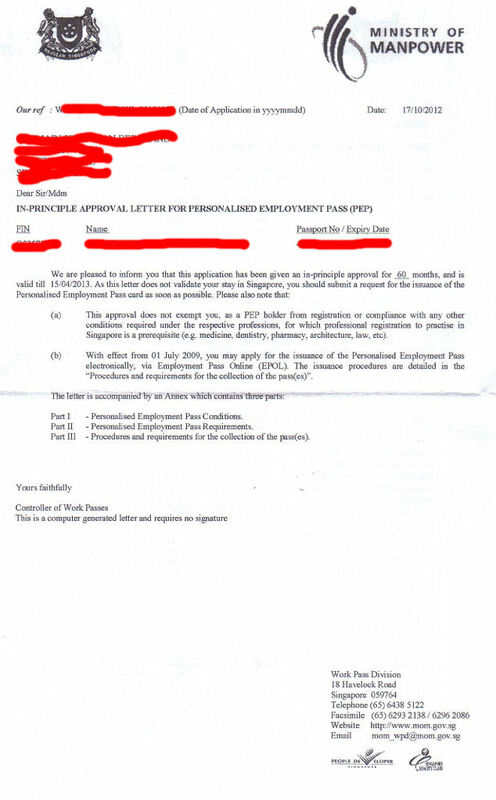 This is the number that was given IPA No: 075347387311125 - B The agent says it will take 5 days for the employer to receive the IPA, but he needs payment now. If I gave you the name of the person to whom IPA was issued, will you be able to check if this is genuine, or if I called MOM will they tell me? Thank you so much for your help. I don't know what an IPA number is. If you looked at the letter you get a FIN number. This will almost always begin with G, then followed by 7 numbers then a letter, as in G1234567A. This is the only number that matters. There is one other number called "Our Ref" at the top of the letter but that always starts with "WPD". The number might have been a transaction number but that's only a tracking reference, not an approval, and it is 13 digits long, not 14. Besides, it's not the employer who receives the IPA, it's the applicant. It is what you need to pass through immigration when you enter Singapore. Again, ASK THE AGENT TO SEND YOU A COPY OF THE IPA LETTER... it needs to look like the one I posted. I think you are being scammed. If the agent cannot provide the FIN number as I have shown above then he is definitely a scammer. In any event, why not just tell him he'll get his payment when you go and actually collect the work pass? I smell stink on this one. Re: How Can I Verify the Validity of an IPA Letter? Strong Eagle wrote: I received the following in a PM, and will answer here. And this 'friend' should be reminded that messing / faking / amending any official letter entails a prison term not less than 3 months if I remember correctly .. Thanks again. Is there any recourse if this is a fraud. My friend lives in India, the agent lives in Singapore. There is an email trail of this. Please tell if anything can be done to recover monies already sent to the agent through bank transfer. mapleleaf wrote: Thanks again. Is there any recourse if this is a fraud. My friend lives in India, the agent lives in Singapore. There is an email trail of this. Please tell if anything can be done to recover monies already sent to the agent through bank transfer. As we would say in Texas, "You are one f*cked duck!" Good luck on trying to collect any money. You could forward your email chain to MOM, asking them to watch out for the agent, but I would bet money he never contacted MOM. Again, ASK THE AGENT TO SEND YOU A COPY OF THE IPA LETTER before you do anything else. Thinking aloud .. is this a case of a guy who got his paperwork settled and now decided that he could have done if FOC ?? You can write to MOM, if you are confident the paperwork has been forged. What happened was..late Jan my friend was promised an IPA in one week and asked for the first instalment of agent fees which was paid, in Mid-Feb another instalment was paid, then the story turned to IPA rejection, reapplication, etc. Now the agent says IPA has been approved but will reach the employer only after a week and to in the mean time pay the final payment. When asked for some proof, the IPA no. was given. mapleleaf wrote: Thanks Strong eagle. IPA approval, in print form, takes a week to be sent to the employer, and that is normal - SMS / SE can confirm the current process. FOC - Free of Charge Sorry for the use of the acronym .. Thanks ecureilx. He isnt looking for FOC, just doesnt want to be conned out of any more money. SMS/SE, please again am lost. Can this IPA no. that was given be verified somehow somewhere. mapleleaf wrote: Thanks ecureilx. He isnt looking for FOC, just doesnt want to be conned out of any more money. SMS/SE, please again am lost. Can this IPA no. that was given be verified somehow somewhere. THERE IS NO IPA NUMBER. When you get the IPA letter it shows your FIN number... as in G1234567X. THIS IS THE ONLY NUMBER THAT MATTERS. If your "agent"/thief cannot give you a valid FIN number then you are being conned. All other numbers are crap. Got it? Got it again? And again, ASK THE AGENT TO SEND YOU A COPY OF THE IPA LETTER before you do anything else. OP, if you are working in SG, you can check for him using the Enquire - Application/Pass Status page by providing his Passport Number? Thank you so much!! got it finally!! He has already requested for an IPA letter, let's see what happens. singaporeflyer wrote: OP, if you are working in SG, you can check for him using the Enquire - Application/Pass Status page by providing his Passport Number? I am not in SG. Strong Eagle, will you be able to check this for me if I PMed you passport no. etc.? Haven't seen this thread till just now. The IPA No: is a 15 digit number at the top of the "In-Principle Approval for Work Permit (Worker's Copy - English)" (taken from one of our newly brought in WP holders). It is located directly beneath the bar code centered on the page beneath the title. There should be a FIN number assigned to it directly beneath the IPA No. The number mapleleaf has provided has the correct number of digits, but unless the agent gave him a copy of the IPA he may not know the FIN: number. sundaymorningstaple wrote: Haven't seen this thread till just now. Thank you SundayMorningStaple ...I tried to check with passport number here https://wponline.mom.gov.sg/WPOLOMController but its asking for employer's fin number in the next page. Please help. Also it looks like that is only for Work Permit number. Is the work permit number and IPA the same? I guess the FIN no. will not come for another 4 or so days. In the mean time, is there anythign that can be done to verify whether this is true. Will the agent be able to see the FIN no. before that? Can any Singapore resident check the FIN no. if yes, I will try to ask a friend of mine who lives there to check it. Please help, I am sorry about the numerous questions. UK expat (non resident) cannot register with "gov.verify"
Assuming you still have your licence can you not just provide a scanned copy?